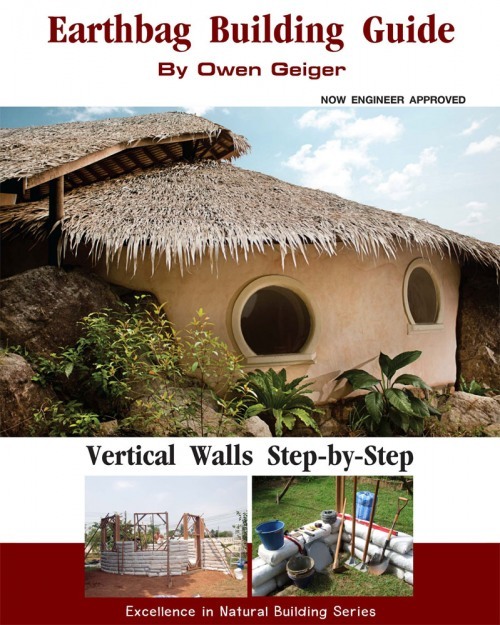 Owen Geiger and I started www.earthbagbuilding.com several years ago and share the popular associated blog. During this time we have examined most earthbag projects that have been publicized in any way and have shared and learned about successes and failures. Owen's new e-book combines this knowledge with lots of hands-on practical experience to provide a concise, well organized step-by-step guide. This builder’s guide provides simple, clear explanations of each step of construction, from earthbag foundations that don’t require concrete, to complete information on tools and supplies, as well as tips, tricks and advanced earthbag techniques. Interesting. A completely new approach to home building, and it looks like something that would belong to a village on a peaceful planet in Star Trek. I like it! This has got to be more economical and doable for countries that are leaning on the 3rd part spectrum too! The building on the cover looks stunning, not sure if it would get past UK planning permission though (!) but your product certainly would help (as you quite rightly point out in earlier posts) in emergency/disaster areas... out of curiosity how long does it take to build the average Earthbag home? It really depends on the complexity of the building project and the experience of the builders how long it might to build. I have seen simple structures completed within a matter of a month or two, but it took me nearly 3 years to finish a rather complex project, working mainly by myself. I want to build. I am leaning toward earthbag,dome. I want to ask you, is hemp a good material maybe as a mixture to soil? I want to build in Minnesota, and thought that hemp would be an excellent insulator that I could combine and then fill my earthbags with. Could I plaster with a pumice cement for an exterior? Sounds like that would be good for snow, and rainy climates. wire. I main dome to be 20' by 30' and the the attached one to be 15' and both with loft. We want to use sand fill. Can I mix sand and hemp and then fill? Have would this be a good insulator? I have never heard of hemp being used to fill earthbags, but that doesn't mean that it couldn't be done. I wouldn't expect hemp mixed with soil to provide very good insulation, however. This would take some experimentation to find out what works well. I think that some form of pumice-cement would make a good plaster that would also provide some degree of insulation. Read my other comment about using hemp for insulation. Sand is generally not a good fill material because it is a shape shifter and requires clay, cement, or lime to stabilize it. I suggest that you go to http://greenhomebuilding.com/ask_the_experts.htm if you have any more questions. I think I have a solution presented in Business Fights Poverty. My shelters are industrial made, easy to errect and last almost for ever. My initiative is named Oil for Shelter. Have a look and best wishes.